By Charles W. Kellogg, Jr.
J. Murray Kay Prize Essay for 1897.
" But I say, that even towns and burroughs are more ancient than kings; and that the people is the people, though they should live in the open fields." - John Milton. This subject naturally divides itself into three parts, namely, the origin of the Town Meeting, its development in New England, and the Town Meeting of Brookline, all of which are closely related to one another. I. The Origin of the Town Meeting. At the dawn of history we find living in Europe near the shores of the North Sea, certain Teutonic tribes whose manner of life must always be of interest to us because from them we have inherited some of our cherished institutions. These people cultivated the soil and lived in family groups, each settlement being surrounded by a rude fence or "tun" which has since given the name town to these communities. At various times all the male inhabitants assembled in the "folk-mot," a meeting in which the freemen of the town came together for the purpose of discussing and deciding upon questions which concerned their common interest. In all probability, most of the land in one of these communities was held as common property; part was used for farming, and part for grazing purposes. And these Teutons understood perfectly the right of the majority. Every spring it was voted in the "folk-mot" what to plant in the public land; and if this meeting decided to plant wheat there was no choice for the minority but to obey. This ancient "tun-mot" is the germ from which the town meeting has developed, and as such it deserves special consideration; but the limits to which this paper must be confined will not permit an extended view of this part of the subject. The conditions attendant upon the transplanting of the town meeting idea from northern Germany to England were strikingly propitious. In the first place, the Britons were a primitive people, and at the time of the Anglo-Saxon conquest were so isolated that they were but slightly influenced by the outside world. In the second place, the conquest was complete, thus giving the new institutions a chance to obtain a firm hold in England. It would be most interesting to dwell upon the influence which the town meeting has had upon the development of England as a nation, but that is beyond the scope of the present paper. An English writer has summed up this influence as follows: "The talk of the village moot is the foundation of English History." II. The New England Town Meeting. The New England town meeting is but another stage in the development of the folk-mot. We will touch as briefly as possible upon this assembly, which has been so important an element in the building up of our country. Many writers hold that the town meeting was a natural outgrowth of "New England Puritanism." In a certain sense, the New England people were Puritans; but first of all they were Englishmen. Landing in a country where there was no government to hinder or to help them, the earliest settlers of New England fell back upon their inherited instincts and revived and adapted to their needs the tun-mot of their Teutonic ancestors. It is a striking fact that in the settlement of the colonies New England alone established in its perfection a town form of government. In the southern colonies, the County, controlled by an aristocratic oligarchy, was made the political unit, and in New York where the Dutch began by establishing along the Hudson a veritable feudal system of land tenure, there was later developed a combination of the New England and Southern ideas, which divided the local government between town and county. The New England system with its democratic collective assembly proved vastly superior to either of the others, and we are not surprised at the political intelligence and self-reliance which it fostered. "Every town is an incorporated republic. The Selectmen, by their own authority, or upon application of certain members of the town, issue a warrant for calling a town meeting. The warrant mentions the business to be engaged in, and no other may legally be executed. The inhabitants are warned to attend, and they that are present, although not a quarter or a tenth of the whole, have a right to proceed. They choose a president by the name of moderator, who regulates the proceedings of the meeting. Each individual has an equal liberty of delivering his opinion, and is not liable to be silenced or brow-beaten by a richer or greater townsman than himself. Every freeman, o1 freeholder, gives his vote for, or against, as he pleases; and each vote weighs equally, whether that of the highest or lowest inhabitant." The folk-mot decided questions of peace and of war; and similar problems were brought before the New England freemen. The experience gained in handling men and supplies during the colonial wars made the New England colonists able and ready to provide recruits and military stores when the day of their own need came. The divine fire of patriotism once lighted, the men of the assembly never allowed the flame to languish for lack of fanning. The force which the town meeting could exert was thoroughly appreciated both in England and America. The following extract from a letter written by a Tory to a friend in England will serve to show in what estimation this meeting was held by the foes of American liberty: "The town meeting at Boston is the hot bed of sedition. It is there that all their dangerous insurrections are engendered; it is there that the flame of discord and rebellion was first lighted up and disseminated through the provinces." With this very brief sketch of the town meeting as it appeared to those who saw it in Revolutionary days, we will leave the subject of the New England town meeting and turn our attention to a particular example which still serves to illustrate the value and possibilities of that time-honored institution. III. The Brookline Town Meeting. In March of the year 1700, a humble petition was sent to the town of Boston, "for the inhabitants of Muddy River to be a district, or hamlet, separate from the town" (Boston). The parent town, Boston, not only refused to grant the petition, but sharply rebuked the presumption of the petitioners. This rebuff angered the inhabitants of Muddy River exceedingly, and on the seventeenth day of June, 1704, they petitioned the General Court, "that they might be allowed to be a separate village." Even this petition, on account of Boston's strenuous opposition, was not granted. In the year 1705, however, a petition signed by thirty-two inhabitants of Muddy River, was favorably received by the General Court of Massachusetts; and on the thirteenth of November of that year, a bill was signed by Governor Dudley, constituting Muddy River a town by the name of "Brookline." This date, therefore, marks the incorporation of the town, and the foundation of the Brookline Town Meeting. From the beginning of its separate existence in 1705, down to the year 1770, the town pursued the even tenor of its way. The doings of the people in town meeting we find in the Muddy River records. So much of the town life is reflected in these records, that a history of the town meeting from 1705 to the Revolution, is the history of the town itself. The meeting-house, for instance, was owned and controlled by the town, and hardly a year went by for nearly a century after the incorporation of the town, that some action was not taken in town meeting relative to pews, to the minister's salary, or other church matters. The interests of education were not neglected; in the year 1712, only seven years after the founding of the town, we find the record of an appropriation of £25 for school expenses for the current year. Every succeeding year the town took action on the schools at its annual town meeting in March. The sum appropriated steadily increased, and in 1737 it had reached £80. From its earliest beginnings, Brookline realized the importance of good roads. The office of "Surveyor of Highways " we find to be one of the first on the town records, and there are many references to the construction or repair of highways. In May, 1749, we find that the inhabitants voted to "let the swine run at large this year." The simplicity of the interests considered at these early meetings is in marked contrast with the complex municipal problems which the citizens are now called upon to consider. Having taken this brief survey of the Brookline town meeting in its early years, let us pass on to the year 1767. It was then that Brookline and her sister towns began to make history very rapidly. In town meeting, December 17th, 1767, it was unanimously "Voted, That the town should take all prudent, and legal measures to discourage the use of European superfluities." From this date (1767) till the Revolution, and all through the war, the records of the Brookline town meetings are filled with patriotic resolves. Dec. 11, 1772, it was "Voted, To choose a committee, to take under consideration the violation and infringements of the rights of the colonists, and of this province in particular, and make report at the adjournment of said meeting." On December twenty-eighth of the same year, the report came in. Lack of space forbids us to insert it here. On the whole it spoke well for the fire and patriotism of our people, and in its protests against British tyranny it would have done credit to the most rampant patriot in Boston. January 3, 1773, it was "Voted, That this town thinks itself happy, to be always ready to add their mite towards withstanding any arbitrary, or despotic measures, which may be carried on, to overthrow the constitution" [of Massachusetts]. Later in the same year, the Brookline town meeting drew up a set of resolutions, denouncing the outrages of England, and declaring that the town would contribute money and men to the resistance of England's tyranny. On December twenty-first, 1775, and on several previous occasions, are records of action in regard to the payment of soldiers. On this date it was voted to excuse all officers and men of the Continental army from paying their poll-tax. On January thirty-first, 1776, as an encouragement to enlistment, the town meeting voted to provide each of its new enlisted soldiers with a good firearm, blanket, bayonet, and powder, and forty shillings in money. Brookline was the first town to make this declaration, which was in answer to a circular letter sent out by the Boston town meeting to the towns of Massachusetts. From 1776 till the end of the war, we find the records full of ardor for the American cause. We have not room to quote them verbatim. The few resolves already set down are sufficient to show the animus of the Brookline town meeting in Revolutionary times. Its record is clean and patriotic, and one of which any Brooklinian of the present may justly be proud. The acts concerning small-pox, which are interspersed with warlike resolutions, show that our early meetings realized the importance of the discovery of vaccination, as well as the importance of the war which was then in progress. In 1788, it was "Voted, That Wm. Aspinwall be, and hereby is, allowed to build a small-pox hospital at his own farm, and to keep it according to law." On February eighteenth, 1800, it was "Voted, That this town agree to assemble at the Meeting House, on Saturday, the twenty-second instant, at eleven o'clock, to testify their respect for the memory of the late General George Washington." After the death of Washington, little of note occurs in the town meeting until 1814, when we find reference to the second war with England, commonly called the "War of 1812. "On November seventh, 1814, "an invitation was received for the Brooklinians to follow the example of Boston, in volunteering their services towards fortifying the harbor by throwing up two forts on the heights of South Boston. The inhabitants were unanimous in tendering their services toward the desired end." On December seventh, 1814, this article appeared in the warrant: "To know if the town will give anything to the men who were drafted from this town's company of militia, and have served two months and fourteen days on Fort Independence, over and above what is paid them by the United States. "These are the only allusions in the town records, to the "War of 1812." On March fourth, 1816, it was "Voted, That printed notifications be delivered at each house, certifying the business to be acted upon, at all meetings hereafter." July nineteenth, 1862. "Voted, That a bounty of one hundred dollars be paid to each recruit, who shall enlist from this town, under the present call for volunteers The meeting was very large, and all the proceedings were spirited, enthusiastic and unanimous; it adjourned with three hearty cheers for the Union." "Rally to your Country's Call. Let it not be said that the patriotism and liberality of the citizens of the old town of Brookline are not equal to that exhibited by citizens of other towns and cities of our old Bay State." At the meetings after this call patriotic speeches were made by volunteers who had fought at Bull Run, and by other citizens of Brook line. Great enthusiasm was shown. The meeting sang "Hail Columbia" and gave three rousing cheers for the Union at the end of each meeting. At the first meeting it was decided to appoint a committee to have charge of the recruiting. On August twelfth, this committee reported. Moses B. Williams was chairman, and when he announced that the roll of Brookline was full, and more than full, the assembly broke into cheers. In contrast to these records are the resolutions of the Selectmen on April 17th, 1865, when the nation was called upon to mourn the death of Abraham Lincoln. At that time it was, "By the Selectmen, Resolved, That, in accordance with the recommendation expressed by the National Authorities, that the several clergymen of this town be requested to open their churches on Wednesday, the nineteenth instant, at i2 o'clock, noon, for such services as may be deemed proper for the occasion, as a tribute of respect to the memory of our late lamented President; and that the church bells be tolled from eleven till twelve o'clock." We have now reached a period which is, in many respects, the most important in the history of the Brookline Town Meeting. It was during the decade from 1870 to 1880 that the staying qualities of our highly-prized town government were tried to their utmost. To be brief, it was in 1870 that the first agitation was started, for the annexation of Brookline to Boston. As this is the "critical period " in the town meeting's history, it must be described in detail. The first attempt at annexation was made in 1870. This was the renewal of the old question of Brookline's separate existence. An act was passed in the legislature, providing "That such towns and parts of towns lying within six miles of Boston, on the southerly side of the Charles River, may be annexed and incorporated as a part of said city of Boston." The Selectmen were authorized in town meeting to employ counsel to oppose the bill, and it was soon defeated. In 1872, a petition from some Brookline citizens was presented to the General Court, desiring the annexation of Brookline to Boston. To test public sentiment a town meeting was called, and an " Aye " and "No " vote resulted 243 to 82 against annexation. At the opening of the legislature on January 6th, 1873, an order was presented by our representative, asking for the opinion of the Supreme Judicial Court, on the constitutionality of annexation of the town without the consent or application of a majority of its inhabitants. No satisfaction could be obtained from the judiciary, and on May 16th an act was passed to annex Brookline to Boston. Brookline appealed to the court once more, but received a cold shoulder. Her last resource was an appeal to her citizens. "The scene that ensued beggars description. For more than five minutes the hall, containing nearly a thousand men, crowded together as close as they could stand, resounded with cheers of the most joyful band of men that was ever seen. Men waved their hats in the air, mounted on chairs to give more effect to their enthusiasm, and shook hands with every one that was next them." This was indeed a crisis in the town meeting's history. The next attempts at annexation were caused by the wonderful development of the town and the consequent expenses incurred during the early seventies. Such large sums were needed for sewers, water, streets, and a new Town Hall, that the interest account on the debt was increased over one thousand per cent in five years. The result of this state of affairs was, that charges were made before the legislature, that Brookline was "governed by a ring," and that the only way to obtain a pure administration of local affairs was through annexation to Boston. Consequently the General Court attempted in 1875, 1876 and 1879, to annex Brookline to Boston; but in each case the measure was killed by a committee appointed by the town. In the latter part of the year 1879, the annexation fight broke out again, with redoubled force, in a petition to the legislature, signed by 325 citizens of Brookline. At a special town meeting a vote was taken, which resulted 541 against, 272 for annexation. In a week a new committee was appointed to combat the measure. Norfolk County was also arrayed against annexation. In a consideration of the matter which was presented to the Committee on Towns it was shown that neither the interests of the state, nor of Norfolk county, nor the interests of Boston nor those of Brookline would gain by annexation. Since that time the annexation question has never arisen. This was the death blow to the agitation which threatened for ten years to destroy the town government. During the last quarter of a century Brookline has shown marvelously rapid growth and development. From the standpoint of the present, it is profitable to turn back and compare the early town meetings with the town meeting as it exists today. The fundamental principles of the town meeting itself have, except in a few details, changed not at all. At first thought this last statement would seem to be quite what one would expect; but if the reader will glance for a moment at Chart No. 1, which shows the increase in the population during the last century, he will at once realize that a town meeting representing a population of five hundred people, is quite a different assembly from one where there is a population of over 16,000 people. With this thought in mind it really seems remarkable that our town meeting has changed so little. The changes which have come about are two-fold and are both for good. First. The number of town meetings has decreased materially during the last century. It seems strange that as the volume of business increased, the number of meetings decreased. The average number of meetings a year for the last ten years of the eighteenth century was ten. The number of town meetings last year was four. This marked falling off in the frequency of town meetings is due to the system of appointing a committee of twenty or more, who report on the articles in the warrant. Their report is not binding on the citizens, but is intended to facilitate the transaction of business. The result of this most excellent idea is that hundreds of thousands of dollars are appropriated at a single meeting with the greatest possible wisdom and dispatch. The second change is that whereby only legal voters are allowed to take part in the meetings. It was found that persons from "just across the line " used to go to a town meeting when large appropriations were to be made. Accordingly, a policeman now stands at the door of the Town Hall with a check list of the voters, and no one who is not a legal voter is permitted to enter the hall. Thus a perfectly fair vote is obtained. Rapid as has been the growth of Brookline's population during the last half-century, the increase in net expenditures has been even greater. (See Chart II.) The total expenditures of all branches of the town government in 1850 were about $10,000. Such a sum is small for a single item now; in fact, the salaries of the High School teachers combined make a greater sum than the total town expenditures of less than half a century ago! Boston's experience has been cited by many writers as the most striking illustration of the continuance of a town form of government under peculiarly difficult conditions. 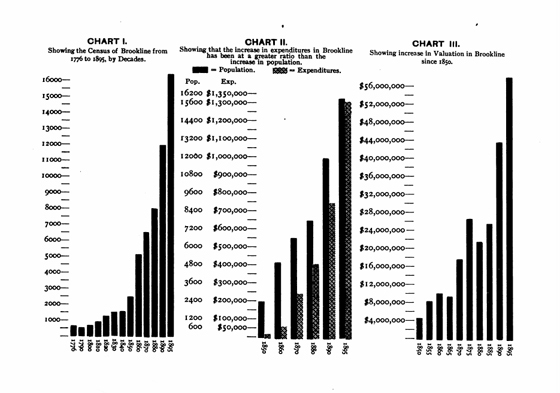 But when Boston became a city with 43,000 inhabitants its annual expenditures were but $249,000,- a sum only one-seventh of Brookline's expenditures for the year ending February, 1895. The net debt of the town of Brookline for the year ending in 1896, was $2,235,673, or 43 per cent of the net debt of the commonwealth of Massachusetts for the same year. All of the foregoing figures speak for themselves. The rapidity with which valuations have risen is but another tribute to the efficacy of Brookline's form of government. 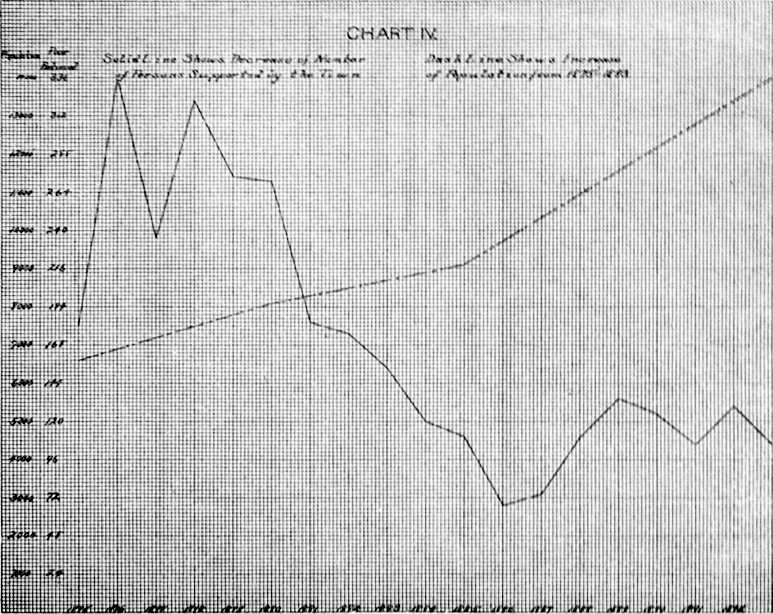 Chart III shows this increase more graphically than it can be told in words. A fair idea of the increase in the volume of business transacted by the town meeting may be obtained by a comparative consideration of the warrants of several years. Only a few decades ago the election of officers and transaction of other business were finished on the same day. Now, however, one whole day is devoted to the election of town officers, and all other business is postponed to an adjourned meeting. It would be natural to suppose that in such a town as Brookline, where the poor are generously cared for, the number of persons who receive aid from the town would constantly increase. 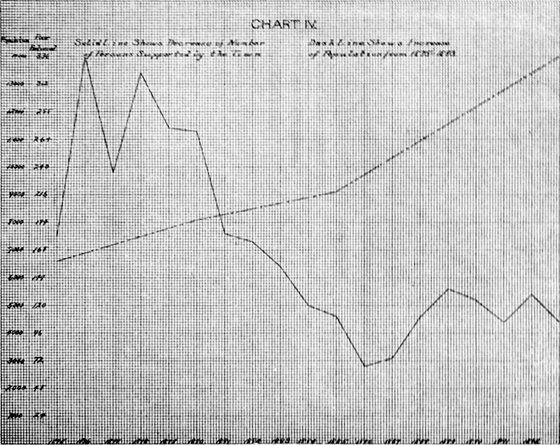 This is not true; for, whereas the population since 1875 has increased, the number of those helped by the town has decreased, as Chart IV will show. This speaks well for the intelligent methods used in dealing with one of the most perplexing of municipal problems. The Brookline town meeting enjoys one distinction which is rather unique. The debates have always been ably conducted and the speeches have been spicy and at times eloquent. The assemblies are not disorderly squabbles like those in Quincy which Charles Francis Adams describes. It is one of Brookline's blessings that the most able, cultivated and gifted citizens attend the town meetings and take a lively interest in town affairs. The result is that one may hear in the Town Hall speaking of the highest order. One of the principal forces which tends to make our local administration so perfect, is the system of reports from all the town officers. These reports have to be submitted to the citizens in town meeting assembled, so that a town officer is very careful what he says and does, because he must "run the gauntlet " of his fellow citizens. The value of this system is shown most clearly in the treasurer's reports. There is nothing which satisfies the public so completely as the assurance that the finances of a municipality are honestly managed. The treasurers' reports since 1850 have been very full and exact. The order at Brookline town meetings of late years has been excellent. Now and then some joke is sprung or some local hit is made; but the usual proceedings are very quiet and orderly. The reporters of Boston newspapers have been inclined to exaggerate all ludicrous scenes, but this is done simply to make news that will attract a certain class of readers. The most violent scenes in the town meeting occurred during the decade from 1870 till 1880, when the "Annexation fever" was raging. Several prominent men have done a great deal toward making the history of Brookline town meetings during the last twenty-five years. James Bartlett, J. M. Howe, Alfred D. Chandler, Charles and Moses Williams, Albert L. Lincoln, Jr., William I. Bowditch, William Aspinwall, William H. Lincoln, Clement K. Fay, Edward Atkinson, John McCormack, George Griggs and Moorfield Storey have all done their share toward guiding the town meetings for a quarter of a century. The Brookline town meeting of the past has been a success; the question is, What about its future? The last fifty years in Brookline have clearly illustrated that with a strong, pure town government the principle works the same, whether the appropriations are a hundred dollars or a hundred thousand dollars. For the present our town system is ideal, but as the town increases in size some change will be necessary in the town meeting. Mr. Alfred D. Chandler suggests that the town be divided into five wards, from each of which sixty men shall be chosen to constitute the town meeting, otherwise the town government to remain unchanged. This certainly seems to be a very feasible as well as a very excellent plan. Another citizen suggests voting by mail, as an escape from our present difficulties. In respect to wealth, appropriations and good government, Brookline is the first municipality of its size in this country. Someday, however, Brookline will have to solve the problem of city government. At present there is not a city government in Massachusetts, if there is in this country, which is perfectly satisfactory. Will Brookline also fail? Let us hope that she may long continue to hold her present form of government. This cannot be done without the co-operation of the young men of the town. It is of the highest importance that they should attend town meetings and learn to talk and to vote intelligently on local affairs. The town meeting should be an educational institution, the school of the citizen. "The right and duty of the citizens, to understand and manage their own local affairs; to establish and superintend their own schools; to organize and enforce their own police; to lay and levy their own taxes, and to regulate and control the expenditures of the moneys raised by taxation; freely choosing their own agents for all these local purposes, and their own representatives for the larger concerns of the Commonwealth; . . . the possession and exercise of these special powers and obligations of towns, as they were so long known from the earliest period of our Massachusetts history, have done more than all other things combined, to quicken the intelligence, sharpen the faculties, and develop the man hood and self-reliance of the whole people, and to make them capable of achieving and upholding the prosperity and the liberty in which we now rejoice." 1. Two prizes are given annually to the senior class of the Brookline High School for the best original contributions to local history. 2. This description of a Revolutionary town meeting is a fair picture of the Brookline town meeting at present. 3. These " European superfluities " were tea upon which England had levied a tax of three pence per pound; and also glass. The " Boston Tea party" in 1773 was an expression of the same sentiment above. 4. See Chandler's "Brookline" for a very full account of the "Annexation Days." New England Magazine for August, 1893.